Tokarzewski-Karaszewicz, Oksana [Токаржевська-Карашевич Оксана], née Lototskyi – active figure in community affairs; born on 14 April 1897 in Kyiv (Ukraine; at that time – Russian Empire), died on 1 January 1950 in London, England, United Kingdom. Married Jan Tokarzewski-Karaszewicz. In 1919-20 Oksana Tokarzewski-Karaszewicz was a secretary at the embassy of the Ukrainian People’s Republic in Istanbul (where her father, Oleksander Lototskyi, a prominent figure in the Ukrainian national movement of the early part of the twentieth century, served as ambassador, as did, subsequently, Jan Tokarzewski-Karaszewicz whom Oksana married in 1922). In 1924 she moved to France where she wrote articles on Ukrainian subjects for French and Italian periodicals and organised Ukrainian concerts and exhibitions. As an active member of Ukrainian women’s organisations she took part in international women’s congresses in Vienna (1921) and Paris (1926). From 1936 she lived in Italy where she wrote on Ukrainian affairs for L’Osservatore Romano. In 1948 she came to live in London. 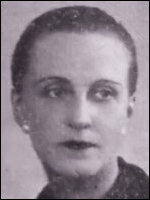 She became a member of the initiating group for the establishment of the Association of Ukrainian Women in Great Britain (AUW), an autonomous section of the Association of Ukrainians in Great Britain (AUGB), and in August 1948 was appointed by the AUGB executive to the initial executive committee of the AUW. At the first annual general meeting of the AUW in March 1949 she was elected to the executive committee for the forthcoming year.